Dixon salvaged what began as a disastrous day by finishing fifth in the series’ return to Portland International Raceway in Oregon after an 11-year absence. Combined with title rival Alexander Rossi’s eighth-place finish, Dixon added three points to his lead for a 29-point margin heading into the season-ending INDYCAR Grand Prix of Sonoma in Northern California on Sept. 16. Dixon, the four-time series champion from Chip Ganassi Racing, and Andretti Autosport’s Rossi are the primary title contenders in an event that will pay double points. Team Penske’s Will Power and reigning series champ Josef Newgarden remain in mathematical contention, each 87 points behind Dixon. On a day when Sato started 20th and relied upon a self-imposed two-stop pit strategy to reach Victory Lane, fan-favorite “Taku” offered “Dixie” some sage advice. Scott Dixon has a comfortable points lead as the IndyCar Series heads to its final event of the season. car field, somehow avoided serious damage to his No. 9 CGR Honda in an incident precipitated by the spin of James Hinchcliffe after contact with rookie Zach Veach. That led to Marco Andretti’s car flipping over the top of the cars wheeled by Hinchcliffe and Ed Jones. No one was injured, and while INDYCAR’s emergency personnel arrived at the scene, Dixon waited for the dust to settle before calmly driving off. “Yeah, definitely thought it was over before it began,” Dixon said during the post-race news conference. “Old saying: Better to be lucky than good. 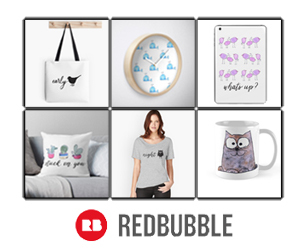 That definitely played-out today. “Had nowhere to go at the start. Tried to slow down, went sideways, hit from behind, off in the dirt. Hit pretty hard actually. Luckily I pulled the clutch once the dust cleared. I didn’t think there was going to be a left front wheel on it (his car). I looked, the wheel is there. Put it in emergency mode, started to get reverse. Was enough room behind me. Backed up. Got the guy to truck out of the way. Couldn’t believe the thing was still driving. After making a pit stop to check for damage under the full-course caution from the incident, Dixon implemented that two-stop strategy and fortunate timing with mid-race cautions to build a bit more point breathing room for Sonoma. The only thing that went wrong for the New Zealander was a pit-road speeding infraction on Lap 39, which he overcame after a drive-through penalty. “I thought at that point we were definitely going to be out because I thought we were going to get lapped,” Dixon said. “Luckily the pit sequence had already started for the leaders at that point, too, so it enabled us to stay on the lead lap. Got lucky with the caution. 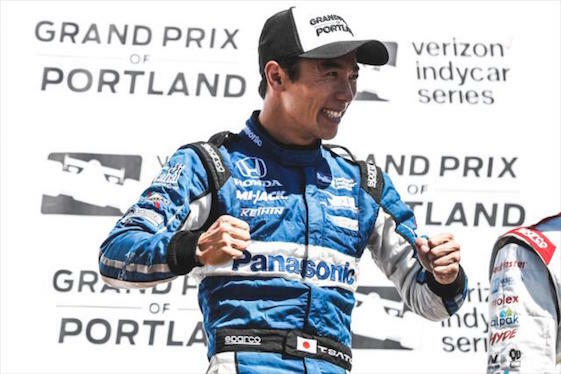 Takuma Sato celebrates his IndyCar Series victory in Portland. second on Sonoma Raceway’s 2.385-mile/12-turn layout, where the winner earns 100 points and second place pays 80. Rossi, who elected to run the expected three-stop fuel strategy, led a race-high 32 laps in the No. 27 Honda but ended up on the wrong side of the caution flag when teammate Veach spun off-course on Lap 56. “I mean, in hindsight we were screwed. But you don’t know at the time, right?” said Rossi, the 2016 Indianapolis 500 champ. “You don’t know what else is going to happen, where people are at on fuel. You just got to try and go out and pass as many cars as possible in front of you, maximize that. I think we did a good job of it. It’s very difficult to pass around here. “But, yeah, I mean, once you get caught by a yellow, everyone else basically gets a free pit stop. That’s what strategy is. If you pit early, get the pit stop out of the way, a yellow comes, they get all that time closed back up before you have pitted. That’s basically how it works. The road for a Team Penske driver to win the championship for a third consecutive year now is considerably more difficult. Pole-sitter Power, the reigning Indy 500 champion, endured a host of trouble during the 105-lap race and finished 21st, while Newgarden settled for 10th place. Power, winner of the previous event on the 1.25-mile oval at Gateway Motorsports Park in Madison, Ill., led the first seven laps before suddenly losing pace due to a gearbox issue. His day also included sliding into the Turn 12 tire barrier and a pit-road speeding penalty. Eventually, the gearbox in the No. 12 Team Penske Chevrolet failed. “I think on the warm-up lap before the green, something happened to the gearbox,” said Power, the 2014 series champion. “It jumped to neutral, I went into emergency mode and made it go into gear and thought, ‘OK, that’s all right.’ Then, coming out of the hairpin on the first restart, it popped into neutral again and everyone behind me went past. Then, I realized I couldn’t use first gear. Meanwhile, Sato traded his typically super-aggressive style for a two-stop pit strategy that paid off for his Rahal Letterman Lanigan Racing team. 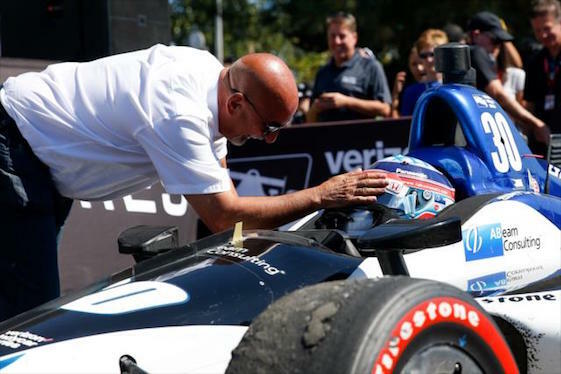 “I think this is one of the most beautiful days in my life again,” said Sato, the 2017 Indy 500 winner while driving for team-owner Michael Andretti. Sato held off former Andretti teammate Ryan Hunter-Reay for his third career victory and first since the 2017 Indy 500. Sato is the eighth different driver to win a Verizon IndyCar Series race this season. Sato noted that his 20th-place qualifying effort was an outlier on a track that last played host to the now- defunct Champ Car World Series in 2007. “Looking at the qualify, yes, we failed basically. We were 20th,” said Sato, a 41-year-old native of Tokyo. “But if you look at the gap between the top front row to the end, it’s a very fraction. I think everyone can have a chance. It’s difficult to overtake. I think we look at the strategy very carefully. Three stop is normal way. Two-stop yellows come in, you need to save the fuel obviously. I was talking to my engineer. We had to try something different. Today is the one it worked beautifully because I started save the fuel from Lap 2 onwards. It was very strategically careful, hit the numbers for the fuel. Then I think it was great. I mean, obviously a couple of yellows came on the very positive for our strategy. “Some guys obviously not happy with the timing, but we had a very bad timing and bad luck in the past, too. Today we were a little bit lucky, but also our strategy was perfect. The car was really great. I was able to commit so much. Sato’s margin of victory was 0.6084-seconds over RHR with Sebastien Bourdais of Dale Coyne Racing third. With Penske’s Simon Pagenaud, the 2016 series champ, and Charlie Kimball of Carlin Racing placing sixth and seventh, respectively, three of the top seven finishers started 20th or lower in the 25-car field. Bourdais _ a four-time Champ Car champion with wins at PIR in 2004 and 2007 _ scrambled away from the first-lap melee to register his fifth podium result at this track in six starts. Bourdais also had rallied from a crash at the end of Saturday morning’s practice to qualify fourth. The Frenchman had just turned the session’s fastest lap when he lost control in Turn 10 and slammed into the tire barrier with the rear of the car. The crew of Dale Coyne Racing with Vasser-Sullivan repaired the chassis in less than three hours. “Yeah, I think it’s just a great reward to all the hard work that the guys put together this weekend,” said Bourdais, driver of the No. 18 Honda. “Really pulled a heck of an effort yesterday to get us on track in qualifying. It didn’t really seem to matter in the end for the race because I guess it wasn’t meant to be easy again. “I had to go to the back after the crash at the start with a broken front wing. Nothing we did, just got caught up in the mess in Turn 3. I was pretty surprised that we actually were able to continue because it was a fairly sizable hit with James that was sideways in front of me. Yeah, it was just a front wing; we dodged a bullet there. 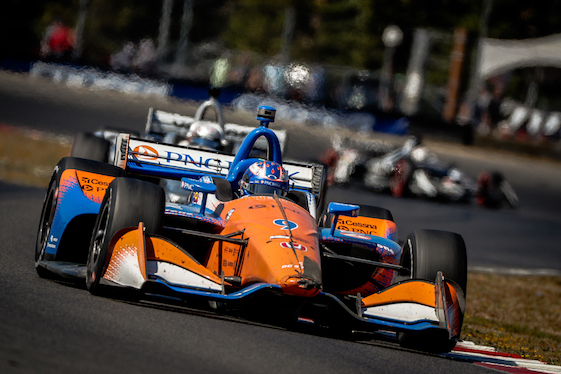 The season-ending INDYCAR Grand Prix of Sonoma will air live at 6:30 p.m. (EDT) Sunday, Sept. 16, on NBC Sports Network and the Advance Auto Parts INDYCAR Radio Network. The Mazda Road to Indy development ladder sanctioned by INDYCAR completed its 2018 seasons in all three levels with doubleheader weekends at PIR. The second race in each series took place Sunday. _ Native Mexican Patricio O’Ward (Andretti Autosport) capped a dominating Indy Lights presented by Cooper Tires season by adding Sunday’s race win to the one he secured Saturday. The 19-year-old resident of San Antonio, Texas, finished with nine victories and a 44-point margin over teammate Colton Herta (Andretti-Steinbrenner Racing) in the final standings. The start of this race saw a six-wide approach into Turn 1, with pole-winner Ryan Norman (Andretti Autosport) absorbing race-ending damage from contact with other cars. Aaron Telitz (Belardi Auto Racing) finished second. On Saturday, O’Ward broke the record for most poles collected in a single season (nine), a mark previously shared by Bryan Herta, Colton’s father; Townsend Bell, Thiago Medeiros and Ed Jones _ all with eight poles. Andretti Autosport’s Indy Lights program posted its 49th win Sunday. Since 2005, the organization owned by Michael Andretti has earned three series titles (2008/Raphael Matos; 2009/JR Hildebrand, 2018 O’Ward) and two Freedom 100 wins at Indianapolis Motor Speedway (2016/Dean Stoneman and ’18/Herta). _ David Malukas (BN Racing) won his third race of the Pro Mazda Championship presented by Cooper Tires season. Malukas finished 3.5-seconds ahead of series champion Rinus VeeKay (Juncos Racing). _ Kyle Kirkwood, who wrapped up the Cooper Tires USF2000 Championship a month ago for Cape Motorsports, tied JR Hildebrand’s 12-year-old record for series race wins in a season (12) by completing a Portland sweep. He held off Rasmus Lindh (Pabst Racing) by 1.98-seconds.